After a few hours of delay at the airport at Detroit we’re headed across the big water for a long-planned Viking River Cruise from Paris to Normandy and back to Paris with a three-day extension to Oxford, England. We’re traveling with our friends and neighbors Bob and Mary with whom we did the Amsterdam to Budapest cruise with extension to Prague a couple years ago. The nearly eight-hour flight to Paris, while tedious, was uneventful. We tagged up with the Viking rep in the lobby of the Paris airport mixing with fellow travelers who we’ll get to know over the next week or so. Finally, our shuttle driver took six of us in a luxurious Mercedes passenger van at about twice the speed of surrounding traffic to the west side of the city where our boat, the Viking Rolf, awaited. I asked our distinguished-looking driver if he had trained for his job at Le Mans. Lunch was ready as we arrived, as were our rooms. Our tiny room with a large bed taking up most of the space seemed familiar – identical to the one we had on our last Viking cruise. A sliding window wall with outside rail opens widely but we have no balcony. Bob and Mary are just across the hall and they have a bigger room with small balcony accommodating two chairs. In our limited space, we have barely room to circumnavigate the bed and stow our stuff in the closet and drawers. A shallow desk crosses the end of the room and is just deep enough for the computer. While Bob and Mary rested up and napped Cathy and I took the afternoon guided stroll around the village at the top of the hill,sortofa wealthy suburb of Paris called Saint-Germain-en-Laye, where we visited a 170-acre garden with spectacular views of Paris, a wide promenade lined with dying chestnut trees, and bordered by an ancient castle with magnificent courtyard, now a museum of archeology. Across the street we visited a 19th century church that looked much older where some special art and artifacts of local history reside. The main street of the little village looks like mid-town Paris with old-style architecture and narrow, winding streets lined with little shops, bakeries and cafes. We had a wonderful chocolate ice cream at the recommended shop. Milen from Bulgaria was our waiter at dinner. He took care of us in style. A jovial, big-personality fellow, he made flowers out of large paper napkins for the ladies and promised a special gift for the fellow later in the week. When Bob handed over his camera asking Milen to take our picture he first turned it on himself taking a selfie with his tongue out. We dined with Bill and Cinny from near Pittsburg and then reacquainted ourselves with the familiar Viking River Boat layout, ambiance and routine. Three young opera singers – two beautiful women and a skinny guy with a pile of thick black hair provided the entertainment after dinner with a comedy routine and intense operatic music. They came with their own pianist whose flying fingers and exaggerated concert style we could see from our seat. While singing like they were in a theater the trio plied the crowd interacting with many. One of them sat on my lap while she beltedout an aria. Sometimes the luck of the draw is with us. Sam was our young and handsome day-trip guide for Paris, where we are to visit the Cathedral of Notre Dame, the Louvre and the Eiffel Tower. Sam grew up in Chicago with a French mother and American father and is a doctoral candidate in English and French literature of the late 19th century. And, . . . an eloquent fellow is he, speaking English without an accent and probably speaking French just as well, though we are in no position to judge the latter. Sam skillfully peppers his narrations with similes, metaphors and literary phrases delivered in carefully constructed full, complex sentences. If one were to transcribe his colorful banter it would need no editing to be ready for the most critical reader. 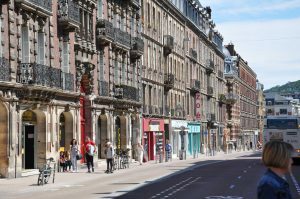 An advantage to visiting Paris in August is that most Parisians are vacationing, leaving traffic in this most densely populated urban area in Europe much lighter than usual. The disadvantage, we’ll talk more about later, is that everyone else in Europe is on vacation as well so we encountered oppressive crowds of visitors in most tourist destinations like the Louvre. An unencumbered motor coach drive into Paris from our river berth west of the city brought us through a variety of neighborhoods, mostly way-upscale ones, with lovely landscaping and beautiful old homes. As we passed into Paris we came to the imposing Arch de Triumph, then zigzagged around the city while Sam provided history and context to the highlights of the city in his charmingly literary style. Sam was surprised at the lack of crowds at the Cathedral of Notre Dame as we got into the short line for entry. We were fairly early, perhaps 9:45. Once inside that dark, massive, soaring old church with flying buttresses providing structural support Sam gave us time to just wander through and soak it all up. We thought about the design and construction complexity of such an undertaking back in ancient times. Studying the symbolism and significance of paintings, icons and statues in every nook, cranny and niche could be a career for a religious or art scholar. We had visited the cathedral a few years ago but were again amazed at the scale of that huge, cavernous religious monument. As we emerged from the dark interior into intermittent sunlight we notice the block-long admission line. We were fortunate again. Lunch was at a classic French restaurant with a couple dozen tiny tables under an awning on the sidewalk. We squeezed into tiny spaces with another tour group for chicken, roasted potatoes and a wonderful desert of ice cream over a soft, caramel-covered pastry. We sat with Candy and Don, a couple from near Seattle who later joined us for dinner and became an adjunct to our small group for the rest of the tour. The restaurant’s bathroom was tiny. Passing through the first door we foundone shared sink for two tiny stalls, one for Madam and one for Monsieur. Sam tells us that Paris is the most densely populated city in Europe somost accommodations tend to be rather small. The Louvre was packed with thousands, maybe hundreds of thousands,of visitors by the time we arrived in early afternoon. People on holiday from all over the world swarmed the endless maze of galleries. Nine miles of galleries in this old castle complex comprise this, the largest art gallery in the world. In just an hour and a half Sam introduced us to the highlights including the Mona Lisa where we were able to see the small painting from perhaps fifty feet away. Viewers were at least twenty rows deep and not moving much. This drop-in-the-bucket overview of the Louvre was enough for us to understand that it would take hundreds of hours to do justice to this collection. Hours I would like to spend someday. An obligatory short visit to the Eiffel Tower for pictures finished our visit to the City of Lights for this day, though some of us will be back for more later in the week. By the way, the name “City of Lights” comes from a bridge built for the World’s Fair of 1902 that featured a line of electric lights on both sides of the span across the Seine, one of the first applications of the new power source for such public lighting. Back to the boat we had the traditional reception to meet the captain and lead staff. A few speeches, champagne then dinner preceded our push away from the dock for our initial run down the river Seine. We had to go a few miles upstream and through a lock before the river would be wide enough for this big boat to turn around and head back downstream for our next destination – the town of Giverny where we’ll visit Monet’s garden. Our dinner companions included our new friends Don and Candy with whom we had lunch in Paris. 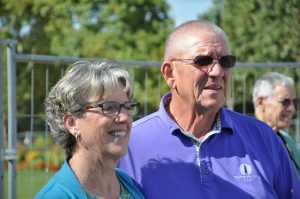 He is retired from an accounting career with the Federal government and she from the municipal power, water and sewer company in Tacoma. Perhaps a demographic comment is in order here. The riverboat holds about one hundred-eighty guests. The majority tend to be retired couples, though on this trip we have at least one single fellow and even some families with kids. Among the guests is not one person of color. The majority of the staff are Bulgarian and very good at what they do. We understand that Viking is an excellent employer. The captain and crew leaders tend to be French or Belgian. We set sail, so to speak, just before dusk from the dock near Paris heading northwest with the brisk flow of the river. Our destination this day is the town of Vernon [‘vair-no’] across the river from the neighboring village of Giverny [‘jee-vair-nay’] made famous by the pioneering impressionist artist Oscar Claude Monet who built his home and studio here. Monet established the gardens as an aesthetic exercise to support his painting and to simply please himself and his guests. Gardens of many varieties have graced our agenda on many trips and Monet’s are certainly among the finest and most historic. Becomingfamous and wildly successful in the late 19th century, the prolific Monet spent most canvases on garden scenes with a variety of compositions. He was the first of his era to challenge conventional styles of painting and is considered the founder of impressionism, a style of painting with less realism and simple, brash strokes of color – sort of a first hint of abstraction. 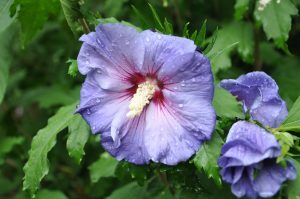 Much of the remarkably diverse flora was in full bloom with vivid colors mixed in every bed – soft, subtle cream-colored hollyhocks next to vivid, yellow dahlias, next to exotic purple rose-of-Sharon. Dozens of annual and perennial varieties share space with fruit and ornamental trees. Most of the roses were spent, though one variety still bloomed with perfect, pure-white blossoms. 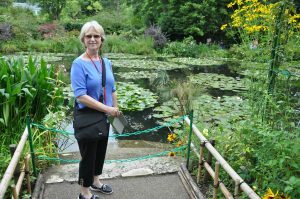 The highlight, and most famous feature of the garden, is Monet’s pond, perhaps an acre or two in size, full of water lilies and punctuated at each end with two bright green, arched foot bridges. The water lilies hadn’t opened for the day. A couple of rustic, old row boats beached next to a stand of bamboo serve as both maintenance vehicles for the pond and an aesthetic detail. Monsieur Monet loved his flowers, as did we. I shot perhaps 200 frames of digital images of just those blossoms that visually jumped out at us. It is easy to see how gardens like these would inspire an artist . . . or a photographer. The large gift shop at Monet’s Gardens has a greenhouse-style roof allowing in bright natural light. The shop features plenty of art and souvenirs and one beautiful black and white cat that appears to live there. As soon as the staff saw the friendly feline inside flirting with the customers they quickly whisked him outside, but not before I was able to stroke him a bit. We arrived at the garden early beating the crowds for our morninggarden tour. 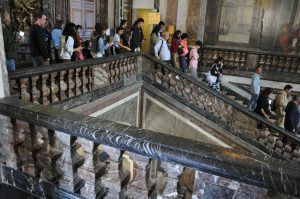 By the time we left midday it was packed with visitors barely able to get around one another and a queue of a couple hundred folks were slowly making their way to the ticket booth. We were back to the boat in time for a Normandy-themed lunch of sausages, and cured meats, sauerkraut, cheesy potatoes, apple pastries, ciders, a variety of wines and craft breads all the while being serenaded by an accordionist. 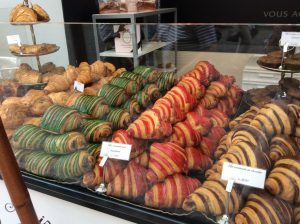 For those who’ve not experienced a Viking River Cruise, I’ll note they are very good at surprising guests with regionally themed visual, auditory and gustatory treats. Our afternoon exploration on foot took us into the town of Vernon andincluded a WWII history lesson with a caveat by our guide that she was unconvinced of some of the details of stories that developed over the years, particularly one about General Patton detailed on a plaque by the dock. We are, of course, not far inland from the beaches of Normandy where hundreds of thousands of British, American and Canadian soldiers came ashore during the greatest invasion in history. It was at Vernon that the soldiers had to cross the Seine for the first time but the bridge had been blown up by the bad guys. The resourceful soldiers built floating bridges in Vernon but after they crossed the river many were lost to attack by Germans who were dug in the forest and caves on the other side. The whole area took serious damage during WWII. Vernon is a medieval city of about 25,000 with cobblestone streets in the older sections where “half-timbered” houses with carved wooden details still exemplify old building techniques. An old collegiate church built and rebuilt from the 11th to the 17th centuries sits on the high ground andsurrounded by a vibrant commercial district. A large and modern performance arts center anchors the upper reaches of the city while centuries-old structures closer to the river lean and list this way and that having obviously been reinforced and shorn up over the past millennia. A substantial number of Venonians take the train into Paris for work but most make their lives immersed in the province. One of the older sections of town through which we strolled appeared to be inhabited by people of color, primarily black and middle-eastern. Ancient building techniques contrasted sharply with more modern styles in neighboring sections of the city. On deck as the daylight began to emerge I found we were cruising into and out of a dense, zero-visibility fog with a welcome chill in the air. Those who know me find my complaints about the sunshine and heat of summer to be a bit tedious I’m sure. Well, none of that this morning. The boat appeared to going full speed. Captain Dario told us earlier top speed is about 12-knots for this nearly flat-bottomed boat with hybrid powertrain. Like a diesel locomotive it has a big, torquey diesel engine running a generator. Big electric motors use those electrons to propel the boat. Another river-cruise boat zoomed past going the other way making it appear we were going much faster. Some areas of the river are so narrow we have barely 30 feet of clearance on either side. Just as the fog began to thin we began to see the tall chalk cliffs on the right side of the river as we entered another lock. Today’s agenda is considerably less ambitious with a good share of the morning free. Cathy got to sleep in a bit and I got to finish yesterday’snarrative. We docked in Rouen (pronounced ‘rue-o,’ but in French the guttural sounds at each end of this name is difficult, if not impossible, for most of us to achieve) mid-morning. We then soaked up a history lesson from our program director, Mimi, about Joan of Arc (pronounced more like the French policeman – Gendarme: that is, ‘jon-dark’) who lost her final battle here being burned at the stake in the old market square in 1431. Her offense was heresy after claiming she heard the voice of Godtelling her to take the land back from the Brits. 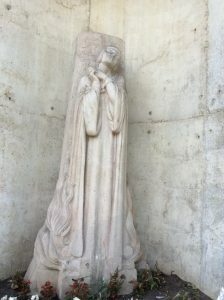 Whether that was divine communication or schizophrenia may be a matter of conjecture, but she later became the patron saint of France. The city of Rouen was badly damaged during WWII but has been restored to reflect its former glory. 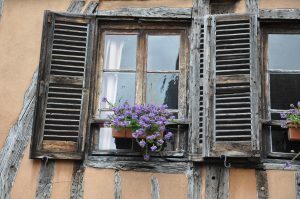 The Viking Rolf remained docked at Rouan while we boarded cramped motor coaches for the drive to the Normandy Coast to visit the beaches where the invasion began. Heavy clouds and light rain threatened but, for me at least, the promise of cool temperatures and lack of direct sun was encouraging. In spite of this region being in a lengthy drought the rural countryside appeared lush and healthy. Many grain fields have been recently harvested. Oddly, many of those fields had a very tall stack of oversize rectangular bales of straw with the usual large round bales strewn about the rest of the field. This farm boy can’t quite make sense of that. Otherfields, some with crops I did not recognize, looked ready for harvest, and, the infamous hedges between them glowed bright green. Our guide, Angelique, referenced flax being a main crop in this area. Best of all, for me at least, was seeing so many lush pastures filled with beautiful cattle: Holsteins, a special breed called Normandy cattle and another dark reddish-brown bovine I’ve not identified. We arrived in little beach town of Bayeaux just before noon amid a crush of tourists and a light rain. 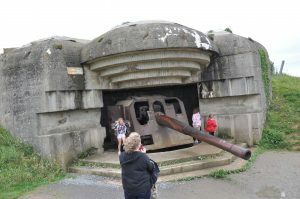 The Battle of Normandy Memorial Museum and a short film presented therein, tell the story of the amazing artificial port built just off shore in just a few days to support the invasion. Massive breakwaters were built in London and floated over to this sandy stretch of beach, then they were sunk, as were a bevy of old retired ships. All were planted far enough from the shore to hold back the waves while they constructed a complex of docks and piers inside the makeshift breakwater. It was an engineering and logistical accomplishment to boggle the imagination. Here on the beaches of Normandy is where the greatest invasion in military history began, leading to the victory of the Allies over the Axis Powers during WWII, saving the world from tyranny – at least for these past 70-plus years. 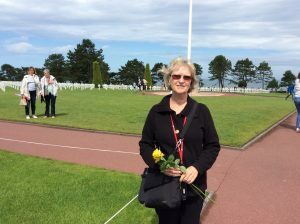 Cathy’s dad was one of those brave young soldiers who stormed the beaches in waves as they suffered massive casualties until they had broken through the German defenses. Military planners made many mistakes but they persevered as the weather both helped and hindered their progress. We’ve been anticipating our visit to the actual site of action and the cemetery will make the story even more real for us. After a less-than-impressive lunch at a local restaurant, which included a zucchini soufflé that few found palatable, we got back on our motor coach and rode a few miles down the coast to a ridge overlooking the beach between Omaha and Gold Beaches called Longedds-sur, where a battery of German, long-range artillery once stood. A few of the deeply rusted 150mm guns remain socketed within their six-foot-thick concrete bunkers facing the sea. We had another opportunity to imagine the violence and horror of those days. Next stop: the American Cemetery where a short but poignant ceremony led by a young French woman awaited our group. As we alit from the bus the driver gave us each a rose to place at a grave of our choice and we had some time to walk among the 9,385 markers reading the names, home states, units and dates of death of the courageous men and a few women who served. The young French woman recounted the significance of the site and America’s contribution to the freedom of Europe as the National Anthem and taps played. We faced two American flags waving in a light breeze atop 50-foot poles. Then, our young host asked all those in the group that had served to come forward and accept the accolades of the group. As one who served in the National Guard during the Viet Nam War era, it never ceases to amaze and gratify me that our service is so appreciated now after being so disrespected back then. The sustained applause from the crowd felt warm and sincere. I gratefully soaked it up as a tear threatened to form in these old lids. The heroes here, of course, are beneath the ground as we’re left to imagine their stories. The beautifully-tended cemetery, on a sloping crest of a cliff, overlooks Omaha Beach. We can stand at the wall looking down to the sandy strip bordered by dense brush on the upslope. We can nearly sense the fear experienced by these brave lads overcome who, through raw courage, jumped from a crowded amphibious troop carrier into the cold salt water carrying probably 50 pounds of equipment. They struggled through the cold surf to a beach being raked with machine gun fire with comrades falling all around. Cathy’s dad, Herb Zachow, was one of these guys, probably 22-years-old at the time, dashing for safety with none to be found. He was in the second wave of solders storming Omaha Beach and he talked sparingly about his experiences those first few days. He once (and only once as far as I know) talked about sleeping in a foxhole the first night beside a dead soldier. What horror, that must have been. Herb was in a supply company so once they fought their way inland he was not in direct combat. He told dozens of stories about great adventures over his next year or so of deployment in Europe – Paris, Germany, Austria – and often proudly exhibited the bits of language he picked up there. Herb exemplified the typical humility of these surviving veterans. 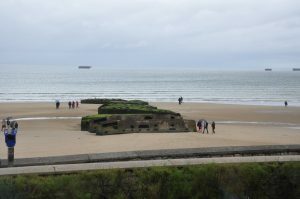 Before heading back to the boat, the motor coach made a final brief stop at a little seaside village at Omaha Beach, now a resort area as it was before the war. We walked out onto the sand where we could get another sense of the place. Monuments to what happened are everywhere and, since nearly everything was destroyed during the war only a few original structures remain. Our return motor coach ride was marred by a highway closure causing a detour through the rural countryside and a few more villages. We thought it would be a good plan to come back sometime, score a press car from one of the European manufacturers and explore the entire province taking our time to soak it all up. 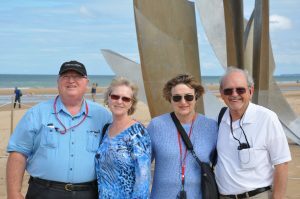 The message of our visit to the Normandy beaches is about how we Americans, along with all our allies, risked everything to save the world from evil. We were united in our mission. We prevailed, not only in winning the war, but also in stimulating recovery from the war, resulting in friendships among nations and people that lasted for generations. 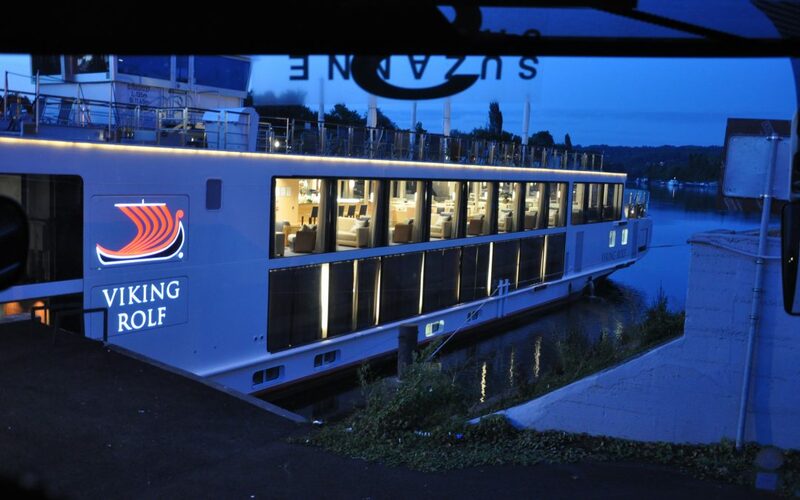 A big part of the charm of a river cruise . . . just cruising. We’ve not gotten much chance to do that on this trip. 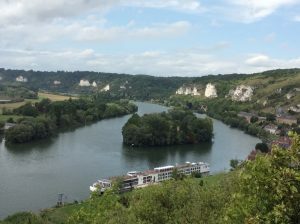 From Rouen the Handsome Captain Dario Web turned us back upstream for a leisurely cruise to the small village of Les Andelys where the ruins of an ancient castle sit atop a 200-foot hill dominating the scene. Along the way the lovely stretches of river offered a variety of views:tall cliffs of exposed white rock, extensive wetlands, small villages, bucolic pastures with grazing brown cattle, dense forests, the occasionalfisherman on the shore, and ubiquitous pairs of swans. The swans must be territorial, we surmised, as we never saw more than two at a time, but often saw them just less than a hundred yards apart. 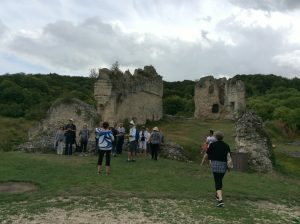 The excursion for this day is a hike up the 200-foot slope to visit the ruins of Richard the Lionheart’s castle, “Chateau Gaillard,” built at the end of the 12th century. It was such a dominant location along the river that it lasted for centuries controlling the passing of commerce. It is now mostly in ruins. Richard the Lionheart was credited with blocking the advancement of King Philip Augustus of France who intended to concur Rouen. Richard was Duke of Normandy and built the castle in just 2 years, depleting his treasury completely. He died just a year after it was completed. Cathy and Candy decided to make the hike but I was ready for a leisurely day on the ship writing these narratives and taking a nap. Besides, I’m not particularly fond of long, uphill hikes. Returning mid-afternoon, they reported it was not as demanding a climb as our program director Mimi made it sound, and that the views from above gave them an enhanced understanding of the region. 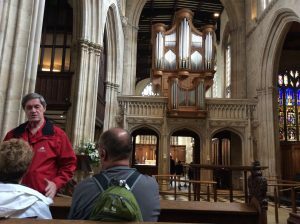 Bob and Mary took a leisurely walk around the village and visited the battered little cathedral where the organ dates back to 1340. 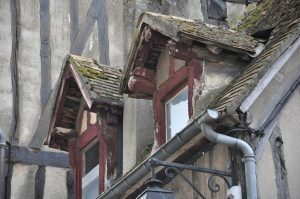 The town is desperately searching for money to restore it all to earlier glory, as have so many other towns and villages. One of our guides earlier described a government scheme offering wealthy citizens a tax credit for contributions to one of these restoration projects. 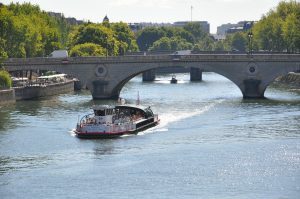 A mighty busy day for some, this final day of the Seine River tour included a morning visit to the famous castle of Versailles, an afternoon at Napoleon and Josephine’s villa on the outskirts of Paris and a late bus tour of Paris at night to view the lights of the city including a light show at the Eiffel Tower. 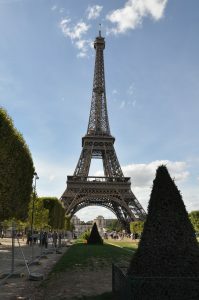 Cathy and I opted out of the evening city tour for three reasons: it was just too much for one day; we had seen the city lights on a previous visit to Paris; and we felt the need to pack for our early transit the next day. Bob and Mary opted out of the afternoon tour for first and the latter reasons, but saw the sparkling lights of Paris at night. 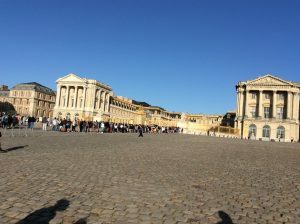 When we were in Paris with a Globus bus tour some years ago we did not have time for the Versailles visit so this was on our must-see list. About a half-hour bus ride brought us through an upscale residential and commercial area to the 200-acre site of the palace and gardens. About five acres of a cobble-stoned approach with two decorative iron fences was beginning to fill with visitors as we arrived, but as a group with a reservation we went in the side door to begin a narrated stroll throughone of the most opulent and artistic palaces anywhere in the world. The surfaces of most rooms are clad with a variety of about a dozen beautiful and varied patterns of marble. Paintings, tapestries and statues tell stories of that time and earlier history but without a guide or a great deal of study the casual visitor would have little sense of the significance of these. And, until you can see it for yourself, I can think of no words that can adequately convey the magnitude, scale and significance of Versailles. I’m tempted to try, . . . but doomed to fail. Outside the palace are 170 acres of fountains, ponds and formal gardens, again adorned with statuary, much of it based on ancient mythology. The gardens are so vast they rent golf carts for those who want to see it all. Even then it would take a whole day. One of many water features on the property is large enough that at one time they imported Venetians to paddle gondolas around it. It was that kind of wretched excess, we’re told, that triggered the French Revolution of the late 18th Century when the starving peasants rose up against the opulent, clueless aristocracy, demanding a piece of the pie, so to speak. By comparison the modest home of Napoleon and Josephine, just a short bus ride to the east, spoke to an entirely different lifestyle. 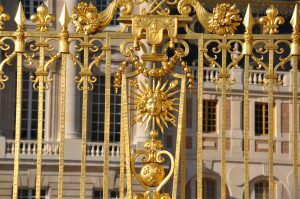 While it is a relatively large and lovely home with nice gardens its lack of opulence and grandeur offer another view of French leadership of the day. Napoleon III administered an empire from this unpretentious home and he appears to have done a much better job than his predecessors. It was an early day, getting off the luxurious boat and bussing to the train station. It was a long, long walk from the bus to the train including trying to take an elevator that thought I was too heavy . . . twice, refusing to lift until I got off. Imagine the audacity of that notion. The fast train took us at 180 kph through the productive rural countryside of northeast France, gently and quietly rocking back and forth at such a speed headed for the Chunnel. Our culled Viking group is 35 adventurous souls who signed up for the extension of three days to Oxford. There we’ll visit Highclere Castle of Downton Abby fame, Oxford University and we’ll get exposed to British history, including much about Winston Churchhill who was born and raised nearby. Most of our group napped on the train since we had such an early call – bags out at 5:15 AM. A pair of Viking guides, Steve and Jamie, met us at the London train station, gathered us up, herded us onto a motor coach and set out for a short tour of London. 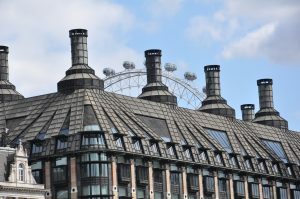 The bus squeezed into an alley and discharged us.Jamie walked us a few blocks to Parliament Square where he offered lots of tidbits of history, government structure and architectural details withclassic British eloquence and humor. These Brits use the language so well you’d think they had invented it. I love to listen to them talk. Jamie, Bob, another car fan in the group and I drooled simultaneously over a lovely old Jaguar XKE Series One that passed nearby setting the stage for later chats about old cars. A lunch break, indulging in what can best be described as uninspired cuisine, at a Methodist Church basement with a large cafeteria, preceded our boarding the bus for the drive to Oxford. It seemed to take forever to break away from the city’s congestion. London, of course, is one of the largest cities in the world and the sprawl went on and on. As we wound through the city streets our other guide, Steve, pointed out an old theater where he noted it was upon this stage that Dame Maggie Smith “first trod the boards,” that is, stepped onto the stage to begin her thespiancareer. Again, don’t you just love the way educated Brits talk. Finally, the views out the motor coach window became more verdant and rural, with rolling hills and little villages, the occasional pasture full of bovine, both dairy and beef varieties, and lots of productive fields. We passed a number of fields with crops we could not identify, and our guides were no help on this topic. Oxford, as you may know, is the oldest university in the English-speaking world. The Old Bank Hotel is a converted bank building in the center of the city adjacent to the University and part of a bustling commercial district. It is nice to have a room so much bigger than the cramped space allotted us on the boat. The WiFi was thrillingly fast and accessible. And, the whole hotel, including the rooms, were rife with art and literature. Behind the registration area a large library provided a quiet and inspiring place to write and could have, if time allowed, provided endless hours of entertainment browsing the volumes. After unpacking a bit, we joined our guide, Steve, for a familiarization walk around the neighborhood. He dropped the names of countless literary masters who hung out and became famous here, many of whom taught at the university. Much of the architecture dates to the renaissance and even earlier. He also pointed out favorite pubs of the historic characters. Though the university students are on vacation lots of tourists take their places this time of year at least on Sunday evening. 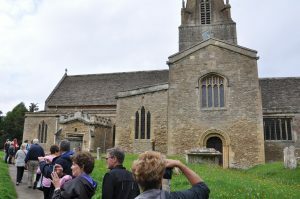 Steve suggested an early evening visit to Crist Church, an Anglican church around the corner, built in 1545, where they do a service every evening that is heavy on organ and choir music. A bunch of us opted for that plan and followed him through a maze of narrow streets to the large church courtyard where a small pond in the center featured a statue surrounded by water lilies and carp. The carp saw us gazing into the pond and photographing the statue and came over with gaping mouths breaking the surface of the water looking for free food, not unlike a pack of journalists. We were initially shooed out of seats we’d claimed because they were reserved for church deacons – none of whom attended. It seemed odd that the congregants face each other instead of the speaker. The cavernous interior of the Gothic style church made for an amazing acoustic environment for both the well-practiced voices and a wonderful, rich organ suspended high above the end of the nave. We stood up and sat down a lot without understanding much of the service, even though it was in English. The music felt like an acoustic massage. Light rain had begun to fall as we walked to the church, and when we left the warm rain continued and intensified. A few of our traveling companions caught up with us and offered one of their umbrellas so we ended up joining them in a search for dinner. Classic British fish and chips, was our quest. We ended up at a musty old pub at the edge of the university called the Eagle and Child, where J.R.R. Tolkein, Lewis Carroll and some of their famous writer buddies used to hang out. The large cod filets were lightly breaded and fried crisp while chips (French fries) were OK. The mashed peas looked just like guacamole and I’m glad someone told me what they were before I took a bite. The contrast from expectation to reality would be too much to bear. The conversation was pretty lively as both the other fellows, Henry Roberts the pharmacist and Steve Smally the recently retired dentist, are both enthusiastic car guys. I think their wives, Alison and Linda respectively, found it all tolerable, and of course, Cathy is used to all that car talk. 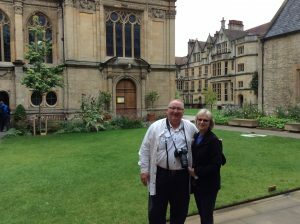 Steve took us on a two-hour morning walk around Oxford University with an enlightening primer of this, the ancient university. Many of the University buildings date back to the middle ages with a great variety of styles and designs and, of course, a great deal of art and architectural detail. The sculptors, stone masons and painters of the day must have been swamped with work. And it continues to amaze that in those ancient times they had the engineering expertise to design and build structures that could last more than a thousand years and still inspire such awe. 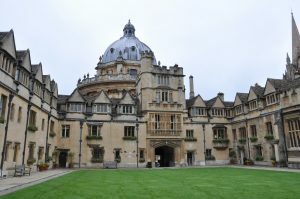 Oxford University is made up of many “Colleges” but they are not what we think of in those terms. In the U.S., the term “college” means an institution that grants a 4-year degree, or subject-specific academic programs within a university. A “university,” simply, is an institution of higher education that offers advanced degrees. 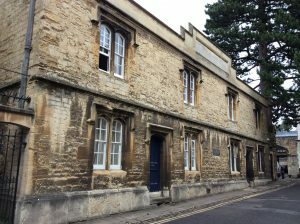 Here at Oxford, a “college” is essentially a residential hall where students are guided individually by a tutor. The students in one college may be pursuing any kind of degree. The 40-plus colleges of Oxford are typically named after the benefactor who funded the hall. Oxford is a larger city than one might expect just hanging around downtown. But once away from the city it is just a short ride on the motor coach to the narrow rural roads along the rolling hills of the Cotswolds. These are the roads through the rolling hills we’ve read about and seen photos of in car magazines for years because this is where journalists drive sports cars when they come to Brittan for testing. I expected more forest. Instead, it is a farming area – again, with many crops even I, as a farm boy, couldn’t identify. It is easy to see, though, why these narrow but well-maintained roads draw the interest of those who love to drive. Will it ever come to pass that we visit one of these endless castles, palaces and cathedrals and be unimpressed because we’ve seen so many? The answer, at least so far for me, is an unequivocal and emphatic . . . no! 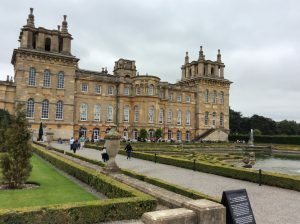 Blenheim Castle dates back to the early 1700s and was first owned and occupied by a Churchill. The titles changed families a few times over the years eventually landing with the Spencers. Winston Leonard Spencer-Churchill was born here and he is a part of both families. He and his family never lived here but he spent much time with his grandmother and cousins in this castle. For a ‘man of the people,” as he liked to call himself, he spent many formative years in this, one of the largest and most opulent palaces we’ve seen anywhere. Filled with art from around the world and set in a most pristine location, the castle reeks of history. We’ve seen so many of these palaces, castles and cathedrals we run out of grand descriptions but this one deserves better than I can do here. Finally, we hopped onto the bus for a short ride to the little rustic village of Brampton where many of the outdoor scenes for Downton Abby were staged and shot. The 1,000-year-old church fills the roll of the Downton village church where weddings happen. Across the street is the Crowley house and just down the street are the post office, pub, pharmacy and locations for many street scenes. Fans of this classic British drama will recognize these locations, especially the church. Back at the Old Bank Hotel, the Benkos and we decided to visit one of the recommended pubs for supper. Strolling the street directly across from the Hotel we chose The Turf, a rustic pub where many celebrities have hung out, including Bill Clinton when he was a Rhode’s Scholar at Oxford. In fact, this may be where he sampled marijuana, but didn’t inhale. A barely legible sign for the pub pointed into a dark, narrow alleythat sloped gently down then turned right where it became even more dark and narrow. We could see the pub some distance ahead. This is another of those old pubs where even I had to duck a few times to get through the maze of small dining areas. As we perused the menu and tried to understand the ordering process the distinguished-looking fellow at the next table, having a brew by himself,leaned in to help. That became the genesis of an entire evening of great conversation. Notwithstanding a heavy German accent, Michael Fernaubecame a charming and stimulating companion who seemed to really enjoy our company as well. He is the director of the German National Library in Oxford on a working vacation doing something related to digitizing ancient manuscripts. Seldom has a film or television series inspired such a dedicated and enthusiastic audience worldwide as has Downton Abby, a series drama set from 1912 to 1922 about life in and around a manor house in central England. The characters, the setting, the intense story lines, production values and certainly the writing, all are stunning. Is it any wonder that Highclere Castle, where much of the story is filmed has become such a popular tourist draw? Fortunately for us, our Viking tour organizers were able to get us into the castle an hour before the unwashed masses begin to arrive. The Carnarvon family now presides over Highclere. Lady Carnarvon is the close friend of the family that owns Viking Cruises and she made a special point of meeting up with us just as we were being awed by the dining room where so many dramatic Downton scenes took place. Lady Carnarvon, exhibiting no airs of nobility, energetically and candidly talked about the history of the castle and their efforts to keep it going. Later we saw her husband, George Herbert, the Eighth Earl of Carnarvon, chatting with folks near the back door. Both show no hint of aloofness or privilege. Above the grand archway at one end of the dining room (and in many more places around the inside and outside of the castle) an inscription in Old French, a language nearly extinct now proclaimed, “Ung je serviray,“ which means, “I will serve but one master.” I asked the docent after she translated it for me if the “one master” was God or the king.” She replied, “Ah, that is the question, isn’t it?” She then added, “Or does it mean themselves.” Good question, indeed. The vast, lush grounds of Highclere are home to hundreds of massive, old, gnarled trees, Cedars of Lebonon, with exotic profiles and trunks so full of character we would expect them to animate themselves at any moment becoming an old, wrinkled giant. Sheep and cattle graze lush pastures and meadows of hundreds of acres of carefully tended and mowed fields. 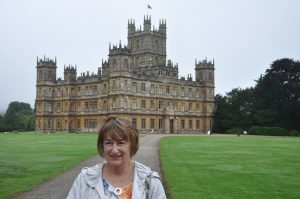 For those of us enamored with the TV shows it is easy to envision Lord Grantham walking these grounds with his beautiful brown dog and daughter, Mary, as he pontificates about his responsibility to preserve the legacy of the estate. Lunch was had at a country inn nearby called the Old Yew Inn where an ancient yew tree guards the front door where even we of little height must duck to enter and duck again as we move from room to room. For many of us it was another opportunity for fish and chips but I’d not recommend the rhubarb cider as it was way too sweet. We finished our day – and this Viking two-country experience – with an unexpectedly poignant visit to a charming old couple in a deceptively large country home. Tucked into a dense forest, the home has over 40 rooms but you would not have guessed it from the relatively modest front view. And, it’s not very old, by European standards, at just over 100 years. Both the couple and the home, as we learned, are steeped in its history. 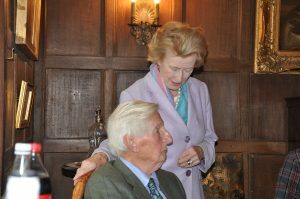 Mrs. Daphne Dormer lovingly hovered over her husband, 87-year-old Michael Dormer, as he described the aristocratic history of his family – connected to Highclere Castle, by the way. The role of both the family and the house, particularly during WWII, is rich with intrigue and importance as many world leaders took meetings there. Mrs. Dormer, quietly and subtly prompted the old gentleman when he needed a word, a change in topic or a reminder to speak up. With a sustained graceful smile, she gently kept her hands on his shoulders and occasionally smoothed his thick white hair as he told stories in his wonderfully aristocratic style injected throughout with dry humor. The home was commandeered by the British Air Command and used as a planning base for the D-Day Invasions and many other operations throughout the war. It was also a refuge for close family friends, the Danish royals, who barely escaped the onslaught of the Nazis. Filling every room in the house are carefully arranged displays of artifacts, memorabilia, documents and collections of many kinds, most with a good layer of dust. The gracious couple genuinely enjoyed the too-short time allotted for pointing out the highlights and telling the stories behind different items. As we left I complimented Mr. Dormer on his collection of specially bound books suggesting I could browse there happily until the end of my days. He generously invited me to do so. Another early call – bags out at 4:45 AM – started our final day as we headed home. Riding the bus into the sunrise, east toward Heathrow, the fog obstructed our view most of the way. As we approached the airport the rural views gave way quickly to the industrial and residential aura of London’s urban outskirts. The midday flight home was, again, uneventful – an adjective we are thankful to use when flying anywhere. In spite of some headwinds and the crossing of time zones we arrived in Detroit just a few hours laterbuy the clock, though nearly 8 hours in the air. In addition to lingering jet lag we may have a bit of cultural lag. Our small town bears little resemblance to the small towns of Europe. The oldest thing here is about 100 years old. Over there it’s not really old until it’s 1,000, and just sorta old if it’s around 500. Also, people in Europe are content with a fraction of the space for personal living as what we take for granted. And the sense of aesthetics, appreciation of art, architecture, design and history so outpace ours we can barely compete. We’ve certainly been privileged to be able to soak all that up and, we hope, incorporate some of it into our own world view.